reimagining folktales old and giving light to folktales new. The Quartet have grown and developed together over the years, emerging first as an a Capella trio, before collecting a fiddle player and setting hands upon new instruments to explore and expand their palette. Their democratic work ethic and highly collaborative creative process informs the diverse styles and varied aesthetics that can be heard within their music. Combining their award-winning three-part vocal harmonies with melodious instrumentals, Tell Tale Tusk’s take on folk is full of highly crafted harmonies, virtuosic voice blending and creative license. 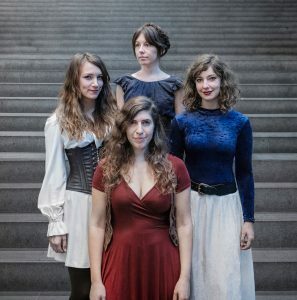 As well as inventive interpreters of traditional music from far and wide, the Quartet work collectively on songwriting to add their distinctive voices to the oeuvre of modern day folk song. The singers of Tell Tale Tusk have captured the imagination of international audiences, and were awarded the prize for “Best Instrumentalist” at Haizetara festival in Spain. The panel of judges decided to treat the three voices as one instrument based on their seamless blending and intricate harmonising.